From yachts to home furnishings, designs by Lidia Bersani stand out for their warmth, high-quality materials and fine finishing. 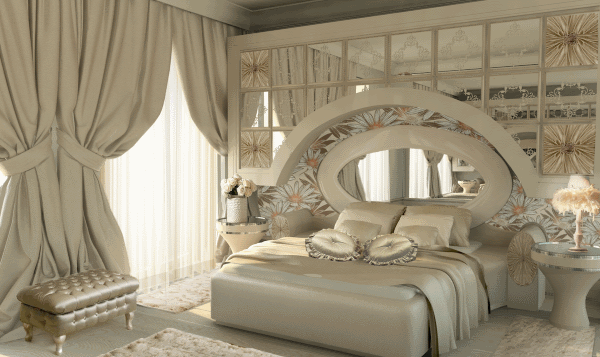 Lidia Bersani is known for designing ultra-modern and high-quality luxury interiors in apartments, villas and yachts. Her work is characterised by use of light pleasing colours with flawless finishing. Her collections range from classical to contemporary, featuring design cues from the bygone era and even bold futuristic styles. 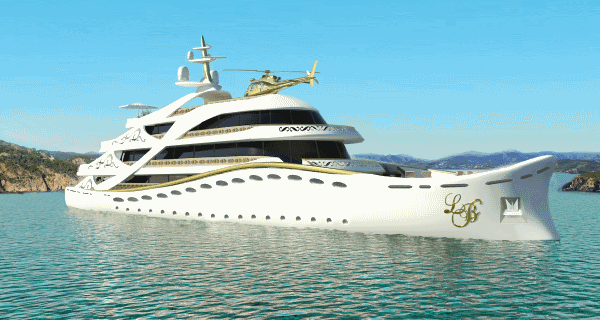 Lidia Bersani was in the news last year for offering an 80 meter-long luxury motor yacht, made especially for women. 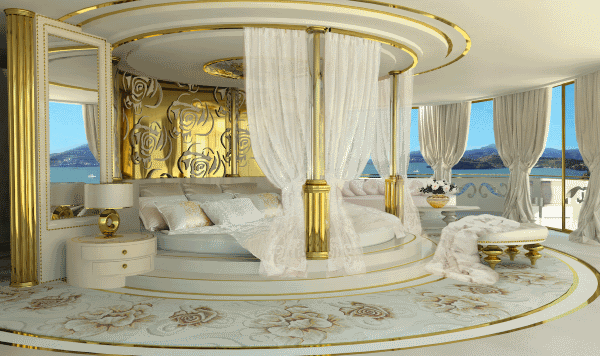 The yacht’s stunning interiors are in colours like white, ivory and gold. 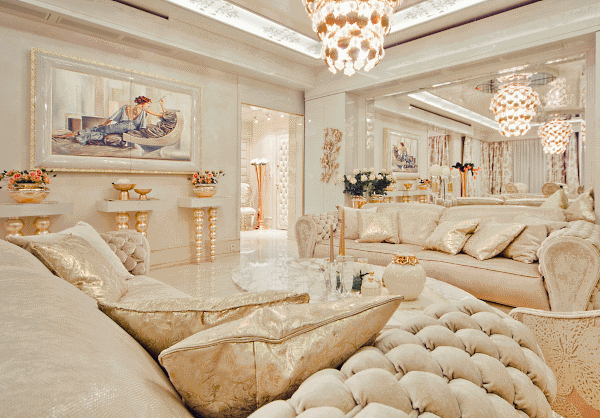 She furnished it with distinctive furniture accentuated by golden elements and crystals. This super yacht by Lidia Bersani is designed for 12 guests and has five elegant guest suites and an exquisite master bedroom with stunning views, a private terrace, and a round king size bed with baldachin. The yacht also has a classy swimming pool, five sun decks, a spa area with hydro-massage pool, sauna, hammam, infrared sauna, ice fountains and more. It also features a few lounges/dining areas with live music facilities, a small fitness club with an amazing outdoor Jacuzzi. The luxury yacht also brags of a grand library with a fireplace, a beauty centre, a disco club, a cinema/theatre screen, elegant bars, and also a helicopter landing pad. For all those people who can’t get Lidia to do up their homes or buy the specially designed yacht, she also offers the Bersani Luxury Collection, which offers home products created from high-quality fabrics, natural furs, leather or feathers. This haute couture home fashion from Lidia Bersani boasts of exclusive hand-made collections featuring unusual fabrics like embroidered silk by gold thread, specially made jacquards or velvets highlighted with Swarovski crystals, gemstones or pearls. People can try out her Luxury Limited Curtain Collections that are timeless, custom-made with fur/feather and Swarovskis. The Luxury Carpet Rugs are also bespoke, made by hand with natural fur, silk, wool and highlighted by Swarovski crystals. 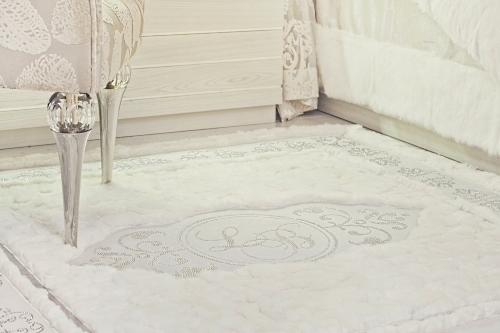 The collection includes Luxury Bedcover and custom-made tablecloth, runner and placemats made of superior materials and decorated with Swarovski crystals. Products from the Bersani Luxury Collection are delivered across Europe, Russia, America, Dubai, and Asia. For more details please visit lidiabersani.com. Tagged Decor, Interiors, Know the Designer, LifeSpice, Luxurious lifestyles, The Pad. Bookmark the permalink.